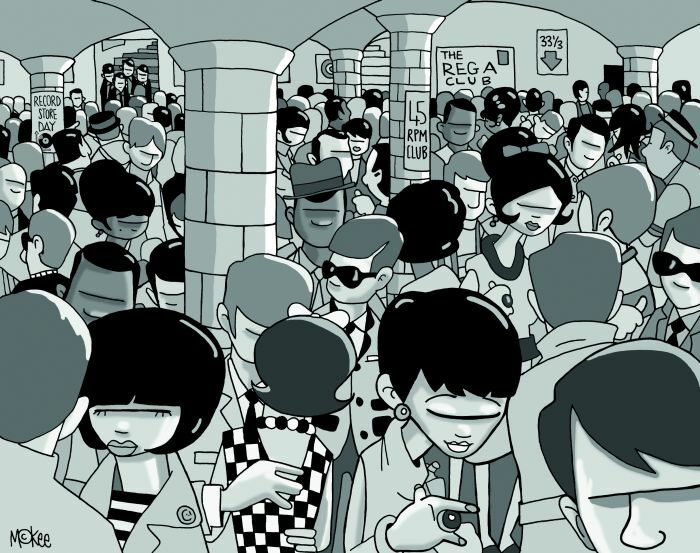 Pete McKee (born 1 February 1966) is a painting and commercial artist from Sheffield. He has exhibited regularly around the North of England. Using bright colours, his larger than life and often humorous characters inhabit a world of working men's clubs, bingo halls and family trips to the seaside. Football is also heavily featured in his work although he regularly depicts fans from both halves of the footballing divide in Sheffield. McKee opened his first London show, entitled ‘Lost Weekends’ in 2007 and has also exhibited in Birmingham and New York since then. Subsequently he was commissioned by Acme Studios to interpret characters from US TV shows The Simpsons, Family Guy and Futurama. Later in 2010 McKee was approached by fashion designer Paul Smith with a view to staging an exhibition of his work at Smith's flagship Tokyo store. This saw the development of Teenage Kicks – a beautifully produced limited edition book that celebrates the influence a musical awakening had on Pete. This McKee retrospective takes in several musical genres; Goth, Punk, Rock, Hippies and Rap are amongst the styles featured in this coffee table tome. And as it comes complete with a very special 12” etched piece of white vinyl Pete has finally realised a dream of having a successful, critically acclaimed record (of sorts). To commemorate this collaboration selected images were reproduced on Paul Smith clothing and bags specifically for the Japanese market. And now, with a stroke of genius from Rega, this years Record Store Day turntable will feature art by the great man himself. Now, Pete Mckee can play his etched white vinyl on his very own designed record player. So, ladies and gentlemen, we would like to introduce the Rega Record Store Turntable by Pete Mckee. Audio T Manchester will be stocking 10 Pete Mckee designed turntables, considering Rega will be building only 500 of these beauties, that's all we may get. So don't miss out if you fancy owning a very, very limited and great value record deck. Also this year, as well as Rega, Record Store Day will be supported by BBC music. Yes that's right, the beeb!! So you know everyones going to be talking about Record Store Day come April 16th. And of course "Auntie knows best".